Gregory Anyasodo, a 47-year-old Nigerian man, has been arrested by some operatives of the Lagos state police command for impersonating a Nigerian police officer. NAIJ.com gathered that the fake police officer was said to have been extorting people in Oshodi up till the time he was caught. Anyasodo, an indigene of Imo state was arrested on Thursday, April 27 after stealing N125,000 from a trader in Oshodi, one of his victims. Mrs Emmanuella Joseph, the unsuspecting victim had goneto report the fake police officer who threatened to confiscate her hand bag and get her arrested at the same time. When operatives of the Lagos state police command paraded the area, Anyasodo was arrested. A walkie-talkie and a police identity card with force number 14873 were found on him. Anyasodo upon his arrest confessed to the crime; however, he denied stealing the woman’s money as claimed by her. “I have been in the trade since December 2016. I came to Lagos before Christmas in preparation for The Lord’s Chosen convention in Lagos, which was held in February 2017 at Ijesha…. My early coming for the programme was for me to seize that opportunity to look for job in Lagos. When I couldn’t get a job, I ventured into impersonating the police,” he said. He also went further to talk about his past crimes. “I have been arrested six times in Owerri for impersonation. I have impersonated WAEC and JAMB officials. I have been arrested thrice by Shell Camp police, Owerri for impersonation…. I am a father of six. I left my wife with six children when I was coming to Lagos. I have been sleeping in hotels since I got to Lagos. “Occasionally, people allow me to sleep on the balconies and corridors of their house after I had convinced them that am a stranger. I make between N10,000 to N15, 000 daily parading myself as police officer and extorting innocent people…. What I do is move closer to them and tell them, mostly traders. I show them my identity card and I threatened to invite my colleagues if they failed to settle me. I collect the money and I move away,” he stated. “I am sorry, I have not sent a dime to my wife in Owerri to take care of the six children I left in her possession but occasionally, I call her. I thought of impersonating police because it would fetch me more money,” he confessed. The fake police officer was not the only one arrested. 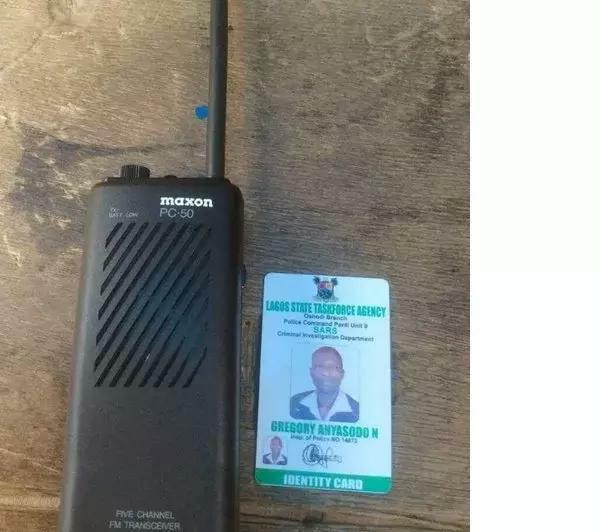 The graphic artiste who designed his police identity card and the owner of the business center were picked up too. The case has been transferred to the state criminal investigation department in Panti, Yaba. Nnamdi Kanu has finally been freed from the prison where he was locked up for months.